Shop online for 24 1/200 ship models at discounts up to 33%. Military Ships is the most popular of the 3 1/200 ship models categories, then Sailing Ships, and Commercial Ships. Trumpeter is ranked #1 out of 7 1/200 ship models manufacturers, followed by Heller, and Academy Plastics. This is the 1/200 Scale USS Arizona BB-39 Plastic Model Kit from Trumpeter. Suitable for Ages 14 & Older. This is a 1/200 scale USS Missouri BB-63 plastic model ship from Trumpeter. 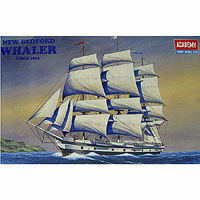 This is a 1:200 Plastic New Bedford Whaler Circa 1835 from Academy Plastics. It's for ages 10 and up.:. Until the 1870s whaling was a very important industry in New England. Sailing half way around the world to hunt the Sperm Whale in the Western Pacific ocean for its oil, the typical whaling vessel made terribly long 3 to 4 year voyages to fill its barrels with the rendered oil that provided the fuel for oil lamps and lubrication for machinery before the discovery of petroleum. Typical whaling vessels carried 20 to 30 men. At its peak, New Bedford had 429 whaling vessels registered calling it home port.:. This is the 1/200 Scale German Bismark Battleship Plastic Model Kit by Trumpeter. Suitable for Ages 14 & Up. This is the 1/200 Scale WWII USS Gato SS212 Fleet Submarine 1944 with OS2U3 Kingfisher Floatplane Plastic Model Ship Kit by Riich Models. This is the 1/200 Scale USS Iowa BB-61 Plastic Model Kit by Trumpeter. Suitable for Ages 14 & Older. This is the 1/200 Scale HMS Hood Battle Cruiser Plastic Model Kit by Trumpeter. Suitable for Ages 14 & Older. This is the 1/200 Scale Golden Hind Sailing Ship Plastic Model Sailing Ship Kit by Heller. This is the 1/200 Scale Le Gladiateur Sailing Ship Plastic Model Sailing Ship Kit by Heller. This is the 1/200 Scale Le Royal Louis Sailing Ship Plastic Model Sailing Ship Kit by Heller. This is a 1/200 scale plastic model Russian Sovremenny class destroyer from Trumpeter. This is the 1/200 Scale PLA Navy Type 051C DDG-115 Shenyang Plastic Model Kit by Trumpeter. Suitable for Ages 14 & Older. This is the 1/200 Scale HMS Nelson British Battleship 1944 (New Tool) (MAR) Plastic Model Military Ship Kit by Trumpeter. This is the 1/200 Scale French Frigate "Acheron" Plastic Model Kit from Zvezda. Suitable for Ages 10 & Up. This is the 1/200 Scale Le Suroit Titanic Salvage & Research Plastic Model Commercial Ship Kit by Heller. This is the 1/200 Scale Spanish Galleon Sailing Ship Plastic Model Sailing Ship Kit by Heller. This is the 1/1200 Scale DGzRS Hermann Marwede Plastic Model Kit by Revell Germany. Suitable for Ages 10 & Up. This is the 1/200 Scale Japanese Battleship Mikasa 1902 Plastic Model Military Ship Kit by Hobby Boss. This is the 1/200 Scale Flying Cloud Sailing Ship Plastic Model Sailing Ship Kit by Heller.